Public investment has fallen sharply under Obama, from already low levels. This may come as a surprise to many, given the repeated assertions of conservatives that government has grown radically during his presidential term. Obama has indeed repeatedly called for the need to revive public investment, particularly at a time when unemployment has been high, and government borrowing rates have been essentially zero in real terms. But Republican control in Congress has blocked this. 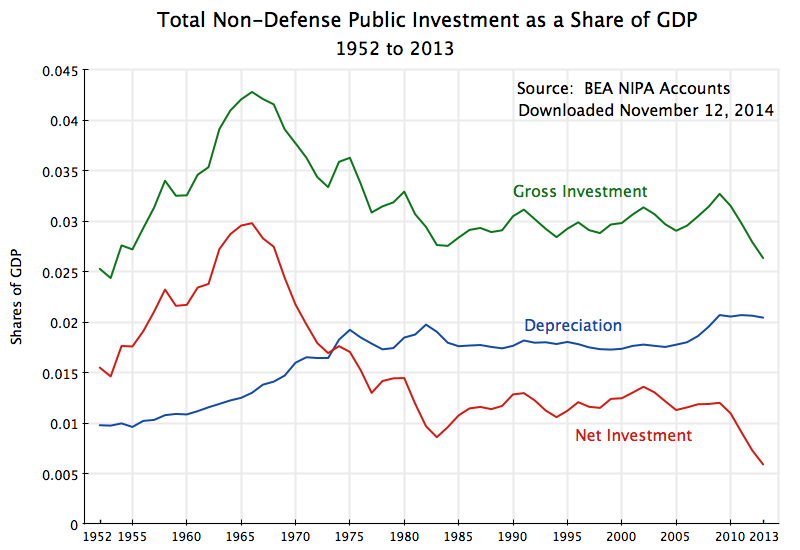 Net public investment after depreciation (and excluding public investment by the military) has as a result fallen in half during Obama’s tenure in office, from an already low 1.2% of GDP in 2009, to just 0.6% of GDP in 2013. And contrary to a common belief, net public investment in 2009 was not exceptionally high. 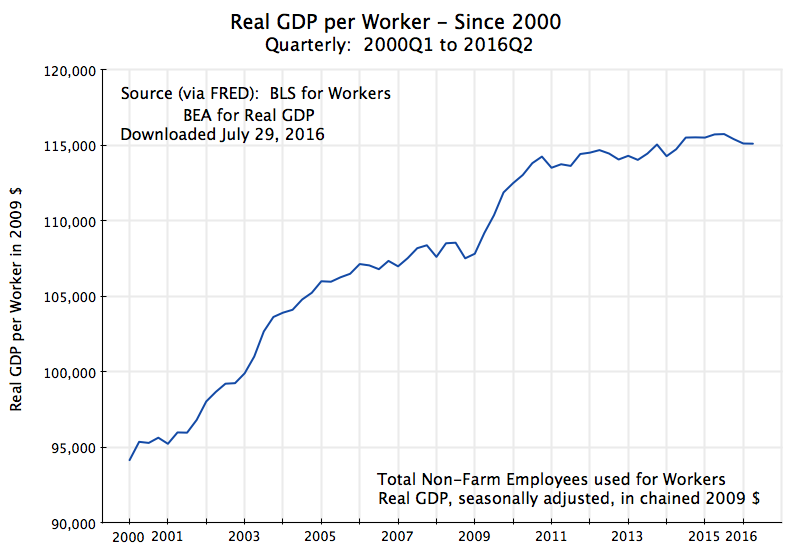 To be precise, it came to 1.20% of GDP in 2009, and an almost identical 1.19% of GDP in 2007 and again in 2008. The 2009 stimulus program, with its focus on tax cuts, did not really do that much for public investment. It rose, but only by barely more than depreciation rose that year on old investments. The fall since 2009 would have been even greater had one included investment by the military, which has also been scaled back. But the focus in this post will be on investment in our economy. The figures are shown in the chart above. The data are calculated from the numbers in the National Income and Product Accounts (NIPA accounts, often also referred to as the GDP accounts) from the Bureau of Economic Analysis. The public investment figures shown here cover all forms of public investment by government other than by the military, and at all levels (federal, state, and local). Using figures for 2013, 60% of the gross public investment was for public infrastructure, 27% was for research and development (as well as investment in software), and 13% was for equipment (such as computers). Many observers focus solely on the gross investment figures, as these can be most easily measured. The GDP shares for gross public investment are shown as the green line in the chart above. But what matters for economic growth is the net addition to productive capacity from this investment, after one subtracts depreciation. Investments wear out over time. The BEA NIPA accounts include estimates of what this depreciation will be (worked out at the detailed individual product levels), and those estimates are shown as the blue line in the chart. The difference between gross investment and depreciation is net investment, shown in red on the chart. The net investment of 0.6% of GDP in 2013 is the lowest level of net (non-military) public investment as a share of GDP in 66 years, or two-thirds of a century. In data going back to 1929 (the earliest year with official GDP estimates), it was only lower during World War II and the immediate post-war years (1942 to 1947), when non-military spending of all kinds was drastically scaled back. 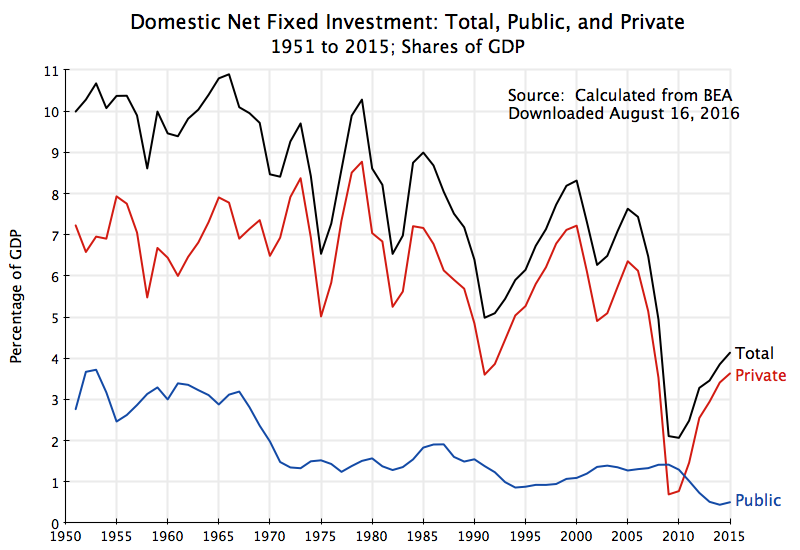 Net public investment rose sharply as a share of GDP in the 1950s and up to the mid-1960s. Its share of GDP doubled, from 1.5% in 1952 and again in 1953, to 3.0% at its peak in 1966. This was the period when we invested in the then new Interstate Highway system, in new and expanded water and sewerage systems, and in government research and development (such as the Apollo moon mission). The economy then grew strongly, with supportive infrastructure. 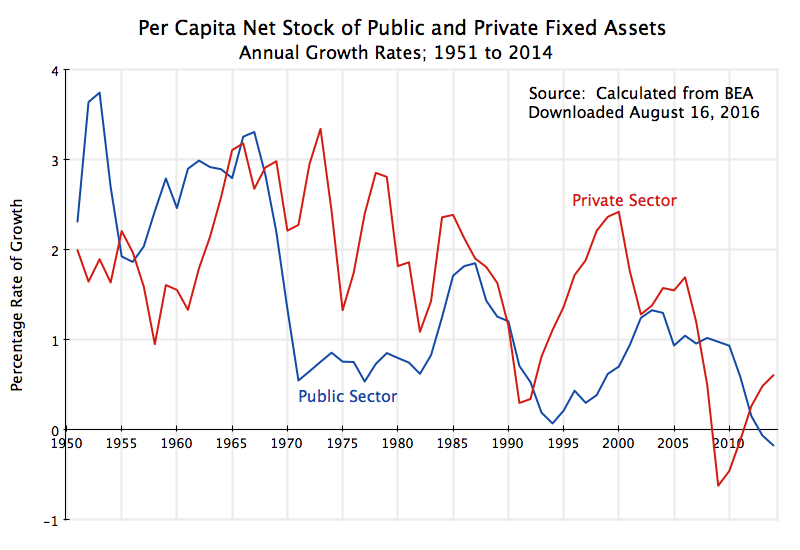 But public investment then started to be cut back sharply, reaching a trough in 1983 of just 0.9% of GDP, after which it fluctuated around a low level of generally 1.1 to 1.4% of GDP. It then was cut back sharply again, by half, during the period Obama has been president. Aside from 1942 to 1947, it is now at a historic low. 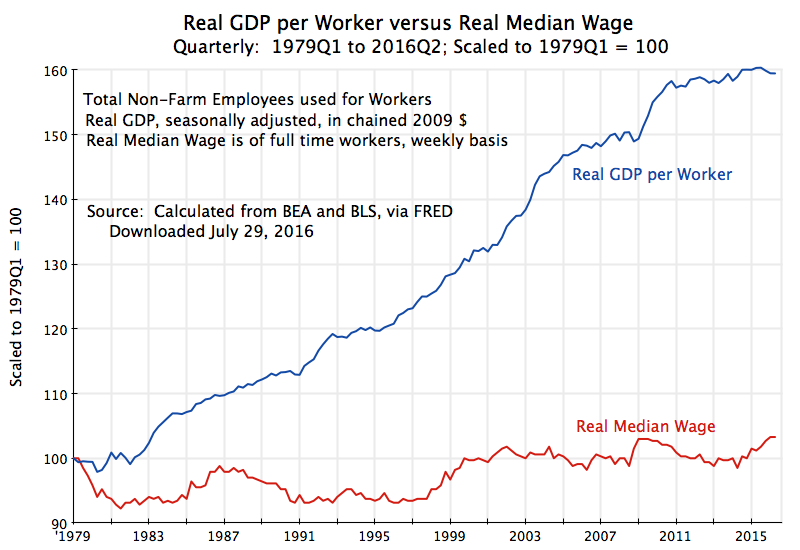 Over this same period, real per capita GDP more than tripled, from $16,675 in 1952 to $52,985 in 2013. It is ridiculous to say the US cannot now afford to invest more in infrastructure and other public assets. We could afford to invest a similar amount to what we are investing now, when incomes were only one-third as high as now. 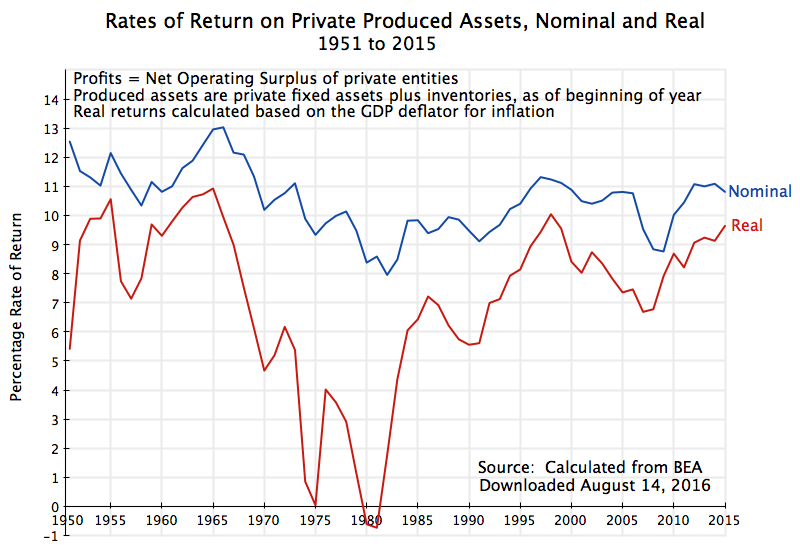 Per capita net pubic investment reached a peak in dollar terms in 1968, at $783 (in terms of 2013 prices). 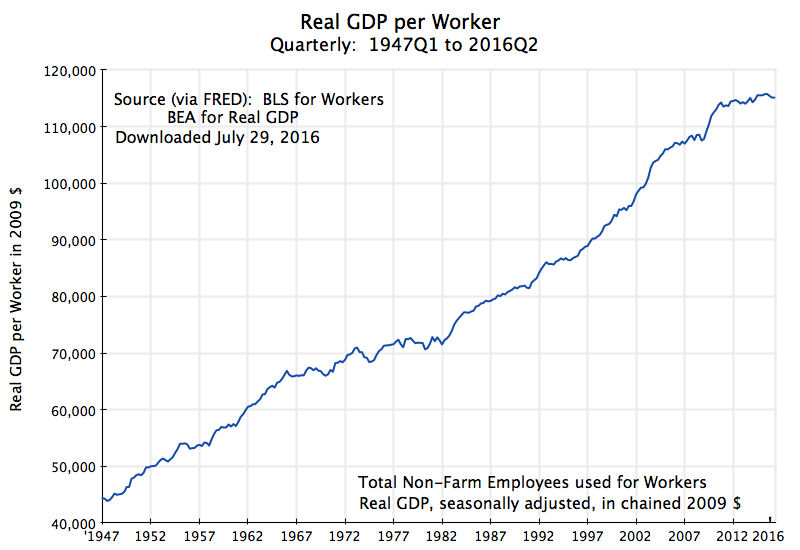 (The peak as a share of GDP was in 1966, but GDP was growing strongly in those years, so the peak in dollar terms could come two years later.) From that peak, per capita net public investment fell to the $313 of 2013, a fall of 60%. But over that same period, real per capita GDP more than doubled. We could certainly have afforded to have kept up, and indeed expanded, our investment in public infrastructure. But the political choice was made not to. The result has been our deteriorating public assets. The poor and inadequate condition of American infrastructure and other public assets should not be a surprise when one looks at how little we spend on such capital. Net spending of just $313 per person in 2013 is tiny. Doubling or tripling this would not be a big burden. One can live on old capital, such as the roads and bridges we built in the 1950s and 60s, for a period of time, but eventually they do wear out. Net public investment of just 0.6% of GDP will not suffice to support an economy that should be growing at 3 to 4% a year. But what we have instead is an embarrassment at best (as anyone who has traveled abroad to Europe or East Asia knows), and one which will increasingly act as a drag on the economy.